Maximum Impact – Carbon Offsetting – is it just b.s.? Are you using your time and resources effectively to have the highest possible positive social impact during your time on Earth? How you allocate your time and money may not just result in a fractional change in your effectiveness. It could change your impact (for better or worse) by a factor of thousands. We must take a step back and make time to be sure that we’re being as effective as possible in line with what is most important to us. In his enlightening book ‘Doing Good Better’ William MacAskill encourages us to put aside our automatic and often ineffective emotional responses to the world’s problems and guides us to choose more wisely and rationally. Where should we be focussing our efforts? 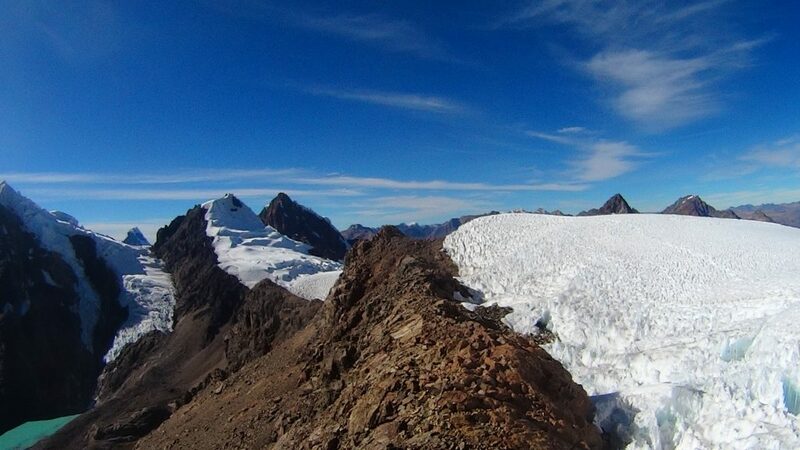 I was told that just a few years it wasn’t even possible to safely climb up to this 5300m+ ridge (Diablo Mudo, Huayhuash) without equipment since it was covered in snow and ice. Is this change a result of global human activity or natural temperature correction cycles in the environment? Let’s not wait to find out. I’ve chosen to take an edited excerpt from his book about effective carbon offsetting (wiki). Why carbon offsetting? First we must decide what we value most. How about we start with the world in which we live in? Without the environment we cease to exist. So, how effective really is carbon offsetting? Which methods are most effective? Where should we choose to put our money? (If this grabs you, I highly recommend his book; “a radical re-assessment of how we can most effectively help others” and the world. Also check his website 80000 hours if you’re looking to make a difference with your career). You might feel unsure about how effective many of the offsetting programmes on offer really are. For example many airline companies give you the option when you purchase a flight to pay an extra fee to offset your contribution to the greenhouse gases emitted during that flight. If you do this, you have to trust that the airline will successfully offset those emissions. But you might worry that the airline won’t do so effectively: perhaps the project they fund was going to happen anyway; or perhaps they overestimate the greenhouse gas reduction from the projects they finance. If so, then the fee you pay to offset all your emissions will offset only some of them. […]we’ve got to do some research in order to find a way of offsetting that’s genuinely effective. That’s what we did at my organisation Giving What We Can. We considered more than one hundred organisations that claim to reduce greenhouse gas emissions with donations and tried to figure out which ones most cost-effectively prevent the release of one metric ton of carbon dioxide equivalent. The charity we ultimately decided was best is called Cool Earth. Cool Earth was founded in 2007 in the United Kingdom by businessman Johan Eliasch and MP Frank Field, who were concerned with protecting the rainforest and the impact that deforestation might have on the environment. The charity aims to fight global warming by preventing deforestation, primarily in the Amazon. It uses donated money to help develop rainforest communities economically to a point where they do better by not selling their land to loggers. Cool Earth does not buy rainforest directly; instead, it provides economic assistance to local communities, helping the people who inhabit the rainforests establish more profitable ventures than selling trees. This involves, among other things, working to secure property rights, improving community infrastructure and connecting the inhabitants of the forests with markets where they can sell their produce at good prices. The work Cool Earth does therefore incidentally improves the lives of those living in the rainforest while working to prevent climate change. You might doubt that such an apparently indirect route (via something that looks more like development aid) can really be an effective way of protecting forests. But if a community that wants to preserve the forest can’t afford not to sell it, helping that community find an alternative strategy seems like a promising way to make a big difference for comparatively low cost. The evidence suggests that Cool Earth’s programme has been effective, with far less deforestation in Cool Earth areas than the surroundings. Moreover, those at Cool Earth think strategically about which regions to provide assistance to. By protecting key areas they can create a ‘wall’ of rainforest that blocks off a much wider landscape from illegal logging. Cool Earth claims it costs them about $100 to prevent an acre of rainforest from being cut down, and that each acre locks in 260 metric tons of CO2. This would mean that it costs just about 38¢ to prevent one metric ton of CO2 from being emitted. When we assessed Cool Earth, however, we wanted to try to remain conservative, so we created our own estimates rather than relying on their figures. After looking at their track record, we estimated it cost Cool Earth less than $154 to protect one acre of rainforest, which protected a further four acres by walling off other areas of forest. Thirty per cent of similar areas of rainforest that were not protected by Cool Earth had been logged, suggesting that they were protecting an acre of rainforest for $103. However, we realised that, to some extent, it might be that by protecting a given area of rainforest, Cool Earth simply causes loggers to cut down a different area of rainforest. We took this consideration into account using economic data, and estimated that every acre protected by Cool Earth would prevent 0.5 acres from being felled, giving a cost of $206 per acre protected. The estimate of 260 metric tons of CO2 per acre is already low, insofar as it doesn’t take into account the carbon dioxide stored in the soil, and doesn’t take into account greenhouse gas emissions other than CO2. But there is a risk that the forest will still be logged in the future, and for this reason we scaled down their estimate to 153 metric tons of CO2 per acre. Bringing these numbers together ($206 to prevent 153 metric tons of CO2) gives our best guess estimate at $1.34 per metric ton. Even after trying to be conservative in our calculations, this number may still be too optimistic. So, to play extra safe, we could assume a 300% margin of error, and use a figure of $5 per metric ton of CO2 emissions prevented. Using this figure, the average American adult would have to spend $105 per year in order to offset all their carbon emissions. This is significant, but to most people it’s considerably less than it would cost to make large changes in lifestyle, such not flying. This suggests that the easiest and most effective way to cut down your carbon footprint is simply to donate to Cool Earth. However, in both cases the analogies are flawed. In buying indulgences, you don’t ‘undo’ the harm you’ve caused others or the sins you’ve done. In contrast, through effective carbon offsetting, you’re preventing anyone from being harmed by your emissions in the first place: if you emit carbon dioxide throughout your life but effectively offset it at the same time, overall your life contributes nothing to climate change. Similarly, ‘offsetting’ your adultery (even if you genuinely could) would still affect who is harmed, even if it keeps the total number of adulterous acts constant. In contrast, carbon offsetting prevents anyone from ever being harmed by your emissions; it’s the ‘equivalent’ of never committing adultery in the first place. What does this have to do with my cycling the Americas? Part of the goal of my trip is to develop my own philosophies, thoughts and perceptions on the world. I decided that both reading and writing could help consolidate this practise.